Winter festival season is here! Instead of onesies, shorts, tank tops and kimonos, get out your puffer jackets, beanies and boots, because SnowGlobe Music Festival has a 2017 lineup on deck that'll have you wishing you were in the snow after just once glance. 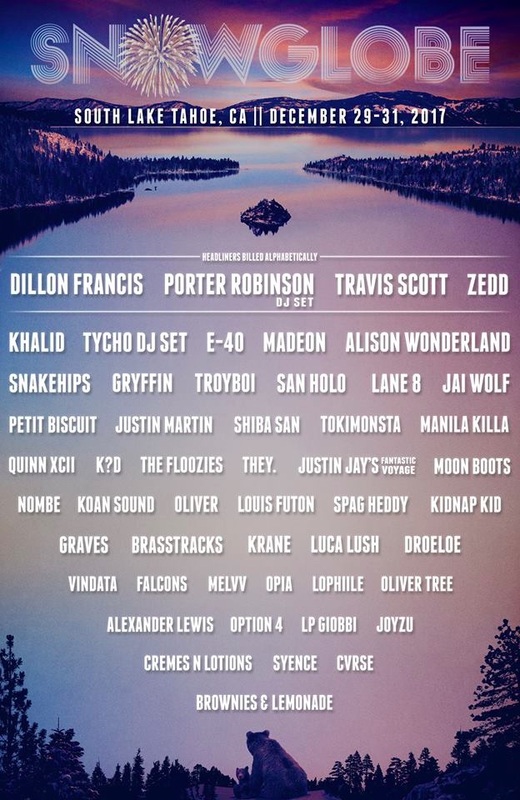 Set in gorgeous South Lake Tahoe, this year's headliners include Dillon Francis, Zedd, Travis Scott, and a DJ set from Porter Robinson, E-40, Madeon, a Tycho DJ set, Alison Wonderland, and Khalid, with many more gems on offer as well. SnowGlobe rolls a dance music festival, ski/snowboard adventure and New Year's Eve celebration into one. Here's how it goes down: you're swaddled in downy North Face garb, swaying and arm-flailing to the beat, while a snowboarder back-flips off a jump next to the stage. Then fireworks burst and confetti flutters and everyone screams "Happy New Year" before getting back to boogieing to stay warm. It's a rad niche. SnowGlobe always brings in 50-plus artists for a mostly electronic party. Big-name DJs, on-the-brink buzz bands and mainstream and underground rappers take the stage in genres spanning avant-garde electropop, post-dubstep, booty house, hip-hop and whatever lies in between. For the adventure sports, SnowGlobe not only sets up a ski/snowboard ramp beside the Main Stage where pro athletes show off tricks, it also arranges reduced-price lift tickets for fest-goers to Heavenly Mountain. One of the region's top resorts, Heavenly rises at the town's edge and unfurls 4800 acres of powdery terrain – and if this winter is anything like last year's, there is going to be tons of snow. So SnowGlobers hit the slopes by day and groove by night. To get you pumped, we have a Spotify playlist ready to turn up to eleven. SnowGlobe Music Festival takes place December 29-31, 2017. Tickets are available now.